The simple interior radiated country charm, with wood floors, mismatched chairs, and rustic flourishes such as the tin bread buckets that greeted every table. 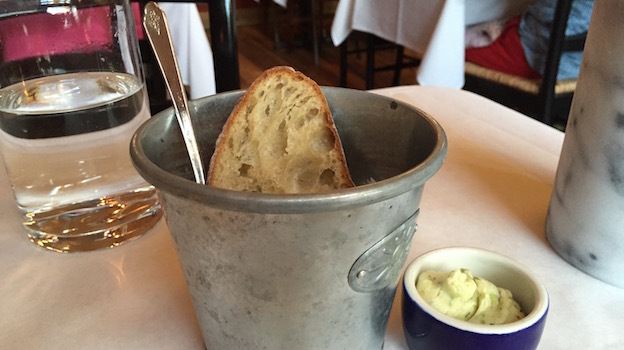 The bread, baked in-house, was perfect in texture, with an airy, chewy center ringed by a lightly crunchy crust. Back in May, it was served with seasonal butter churned with grilled ramps, which imbued it with a subtle, dark sweetness. As the air still had a hint of winter’s chill, I ordered the soup for its warming properties as much as its ingredients. 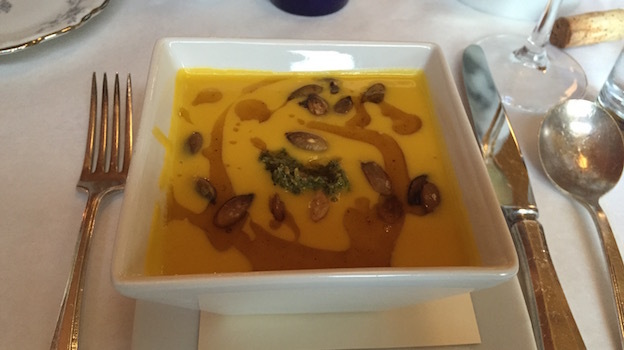 Rich and satisfying, the creamy squash soup was wonderfully complicated by a zesty ramp pesto and the salty crunch of toasted seeds. To accompany this dish, I selected the 2013 Bloomer Creek Auten Vineyard 2nd Pick Clone 10 Dry Riesling. Upon opening, the wine was a touch angular—all elbows and knees for a full 20 minutes. With some air, however, it fleshed out a bit, balancing the strict acidity with a welcome kiss of fruit. Scents of snowpack, snap peas, and candied lemon rind formed the nose, while the palate was vertical and deep, with a thrilling mineral intensity. The citrus tone worked especially well with the soup, while the acidity brightened the dish and readied my palate for more after each spoonful. My entrée was spectacular; like the soup, it was both rich and bright. 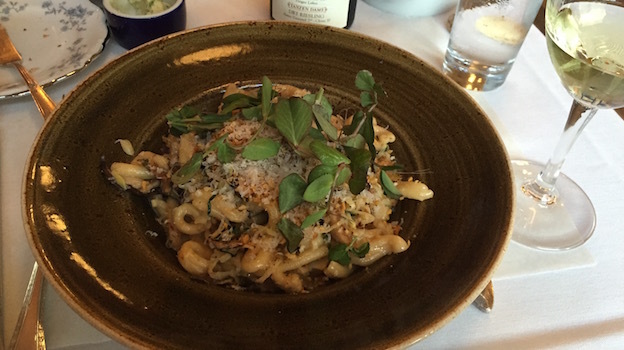 Homemade casarecce pasta, double-barreled in shape, was well-dressed in an earthy, zippy combination of parmesan and crème fraiche that was accented with lemon and horseradish. Shredded cabbage and roasted mushrooms studded the dish, while breadcrumbs and raw pea shoots added textural complexity. 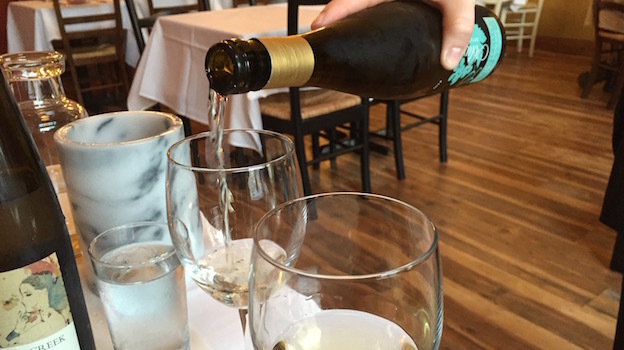 Once again, the Bloomer Creek Riesling handled the food with aplomb—this time, the subtle green, stemmy quality of the wine was the winning element. Purely in the interest of research, I ordered a glass of 2014 Atwater Navone Vineyard Dry Riesling to try alongside the pasta. This wine, served from a freshly opened bottle, was more immediately charming than the Bloomer Creek. The wine was extremely drinkable, with a juicy texture and expressive bouquet of lime juice, star fruit, and a touch of diesel. Though dry and exciting, the wine’s extra fruit actually fought the dish a bit, while the Bloomer Creek’s reserved complexity provided the perfect match. Both wines were terrific, however, and set a lovely tone for the week of adventure that followed.